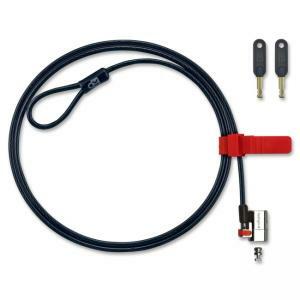 ClickSafe Keyed Laptop Lock is designed for effortless protection of computers and your most important data. Lock attaches to hardware in a single step. Just one click and it's secure. You don't need to insert a key or follow multiple steps. ClickSafe combines a 5' cable made from superior materials with a tamperproof disc-style lock to deliver near-impenetrable protection. Disc-style keying is highly pick-resistant. Super-strong steel cable is 5mm thick. 12.7mm wide x 31.5mm long click lock head offers three rotational degrees of freedom. Laptop lock attaches to your laptop via the Kensington Security Slot found in 99 percent of computers. Master keying is available. Laptop lock includes two keys.